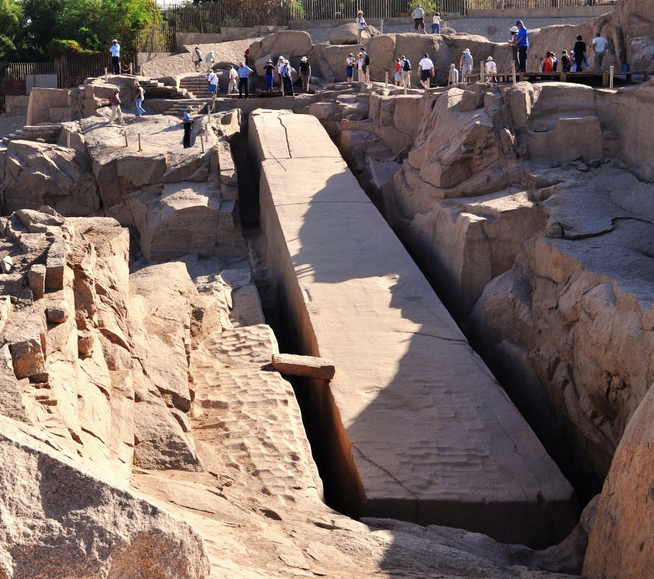 The Unfinished Obelisk is located in the northern region of the stone quarries of Aswan. It is nearly one third larger than any ancient Egyptian obelisk ever erected. If finished, it would have measured approximately 137 feet and would have weighed nearly 1,200 tons. 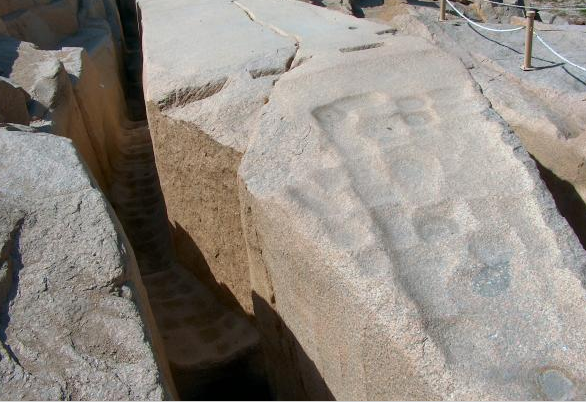 The Unfinished Obelisk offers unusual insights into ancient Egyptian stone-working techniques, with marks from workers' tools still clearly visible and ocher-colored lines marking where they were working. The obelisk's creators began to carve it directly out of bedrock, but cracks appeared in the granite and the project was abandoned. The bottom side of the obelisk is still attached to the bedrock. 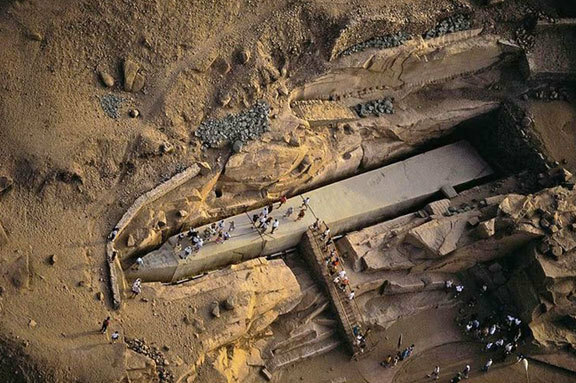 This is a satelite photo of the Unfinished Obelisk, still in place in the Aswan quarries. 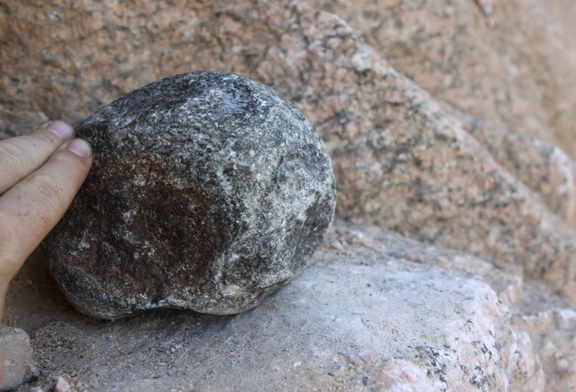 The early Egyptian stone masons did not use chisels to carve the obelisks; they pounded on the granite with small hand-sized balls of the mineral Dolerite, one of the few substances on Earth harder than granite. When the quarry men found a suitable length of granite with no visible cracks, they used copper tools to make a line of small holes (- – – – – -), hammered wooden wedges into the holes, and repeatedly soaked them with water. The wedges would gradually expand, and cause the granite block to crack. Months or perhaps years into the obelisk's creation and removal, fissures began to appear in the granite. When the workers uncovered a profound fissure near the obelisk's center, the project was abandoned. 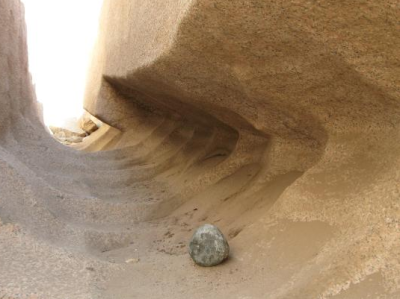 From "The Aswan Obelisk, With Some Remarks on the Ancient Engineering,"
"As it is, the Unfinished Obelisk is the obelisk raisers' most grievous tragedy, a lasting reminder of the limits of human engineering. No rock speaks such volumes as the Unfinished Obelisk. Commanding the presence of a lost city from its rocky bed, it speaks of the hubris of the pharaohs and the grueling labor of their minions, of the triumphs of quarrying and its unimaginable failures. The Aswan Obelisk enables the visitor to look with different eyes on the finished monuments, and to realize ... the heartbreaking failures which must sometimes have driven the old engineers to the verge of despair before a perfect monument could be presented by the king to his god. As I stood beside its enormous bulk yesterday I kept whispering to myself, "
out, for months on end—for your life. It must have been galling beyond words to the Egyptians to abandon it after all the time and trouble they had expended. But today we are grateful for their failure, as it teaches us more about their methods than any other monument in Egypt."